New technologies often depend on designing new materials for specific tasks. Examples include materials for computer memories, batteries, and controlled drug delivery. When developing new materials, scientists and engineers search through a vast range of possibilities including complicated mixtures of ingredients, or architectural organizations of materials that present themselves in structures of different sizes and shapes. A material for controlled drug delivery may have to be porous enough to absorb a drug but have a coating that protects the contents until the release environment is encountered. Design of useful, cost effective, and environmentally friendly new materials is a grand challenge for materials scientists. This challenge requires understanding, modeling, and exploiting the complexity of materials on numerous levels, from the small scale of minute constituents to the grand scale of technological applications. The interplay of behavior on several time and length scales (i.e., multiscale behavior) can lead to unexpected results called complex emergent phenomena. Multiscale problems leading to complex emergent phenomena are generally unsolved problems in materials science. Modern methods of experimental science and engineering heighten the design challenge by offering the ability to produce designed materials and to test detailed design features, though testing all possibilities is usually not economically feasible. Paralleling this expansion of experimental methods has been an explosion in the power of modern computers, and the evolution of the sophisticated computational science algorithms for simulation of materials, particularly specialized algorithms that take advantage of the hardware advances. The combined progress suggests the goal of simulation-assisted materials by design. This goal has been widely appreciated, and steady progress continues. But transformative progress will require a confluence of experimental and computational facilities together with directed intellectual collaboration. This proposal builds upon existing state and federal investments in experimental and computational facilities in Louisiana. 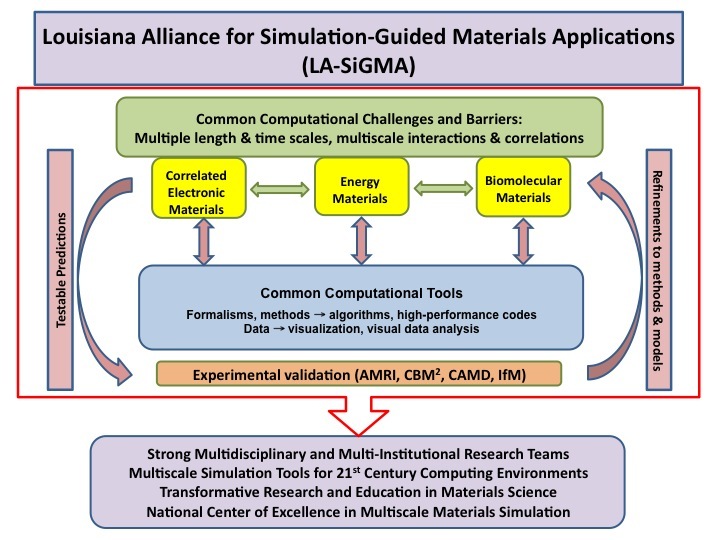 In addition, it brings together Louisiana academic institutions to focus on simulation-assisted materials by design in research and in the education of a new generation of Louisiana material scientists. Three "Science Driver" areas have been identified for specific focus: (1) correlated electronic materials, which show promise as new materials for the design of molecular computers, microelectronics, and high-density recording media; (2) energy materials, which show promise as catalysts, advanced materials for the storage and release of hydrogen, and electrochemical cells and capacitors that store and deliver electrical energy; and (3) biomolecular materials, which can provide encapsulation, delivery, and release of therapeutics to specified targets. The proposal will create the Louisiana Alliance for Simulation-Guided Materials Applications (LA-SiGMA), which would take advantage of the Louisiana Optical Network Initiative (LONI). LONI is the most advanced high-performance computing, network, and communication infrastructure among EPSCoR states. Since the principal barrier to simulation-guided design of materials — multiple length and time scales — challenges conventional scientific disciplines, we will combine researchers with specialized expertise at each scale into teams. Teams will include applied mathematicians and computer scientists to ensure efficient utilization of forthcoming high performance computers and include experimentalists to test, validate and guide the computational simulations. These results and collaborations will help the State compete effectively for a national center of excellence in multiscale materials modeling and simulation. The Alliance members are: Louisiana State University (LSU: lead institution), Grambling State University (GSU), Louisiana Tech University (LA Tech), University of Louisiana at Lafayette (ULL), University of New Orleans (UNO), Southern University at Baton Rouge (SUBR), Tulane University (Tulane), and Xavier University (Xavier). GSU, SUBR, and XU are classified as "historically black colleges and universities" (HBCU) and have large underrepresented minority enrollments. The project will also boost workforce development in the State by creating a multi-tiered set of educational programs. We will conduct specialized courses for graduate and postgraduate students who will enter the workforce as well-trained computational materials scientists. We will establish programs that will encourage high school, community college, and undergraduate students to explore computational materials science as a career. "Research experience for teachers" (RET) programs will train high school and community college instructors in inquiry-based teaching methods in computational materials science. Finally, public lectures will present project success stories in a manner that will inform and excite the citizens of Louisiana. Our project has the potential to effect a transformative and sustainable change in computational materials research, education, and applications throughout the State of Louisiana and to make the State competitive for a federally funded research center by the end of the five year project period. We will push the scientific frontiers in computational materials science, and prepare Louisiana researchers to use the next generation of heterogeneous, multicore and hyperparallel cyberinfrastructure effectively. We will build statewide interdisciplinary research collaborations involving computational scientists, computer scientists and engineers, applied mathematicians, theorists and experimentalists. Most significantly, we will build an inter-institutional computational materials science graduate program that will be unique in its statewide reach and impact, and may be the only one of its kind in the nation. LA-SiGMA Research roadmap. Common challenges and barriers (green) link three Science Drivers (yellow) of scientific and technological importance that leverage existing strengths in the State. Common computational tools will be developed and implemented on the next generation of high performance computing platforms (blue). Experiments at existing facilities (orange) will test computational predictions and lead to refinement of formalisms. These collaborative activities will lead to transformative advances in materials science research and education in the State.